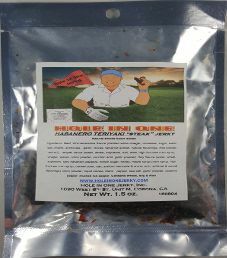 The next review for Hole In One Jerky will focus on a 1.5 ounce/42 gram bag of their Habanero Teriyaki flavored steak jerky. This flavor is described as having just the right amount of spice, and a teriyaki flavor that has nice little kick throughout the chew. The bag was graciously submitted for review by the owners, Bud & Crystal Ott. This Hole In One Jerky brand name is distributed by Hole In One Jerky, Inc. They are located in Corona, California. As a Professional Caddie, Bud needed something nutritional to supplement the demand of covering over 5 miles a day. Crystal began to make jerky, and started with this original pepper. Behind Bud’s back, Crystal worked on a few other flavors, and Hole In One Jerky was launched in October 2014. 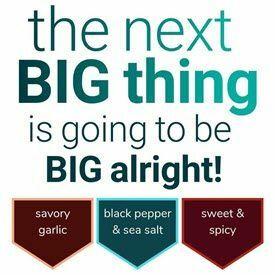 The liquid marinade consists of a very good Worcestershire sauce, a fair Teriyaki sauce, healthy honey, liquid smoke, and a poor maple syrup. It is disappointing to see that the Teriyaki sauce uses the highly processed, cheap sweetener high fructose corn syrup (HFCS). Worse, the maple syrup uses artificial flavors, where maple is not even a listed ingredient. The heat is achieved from using habanero peppers, cayenne pepper, and crushed red chili pepper. Hot peppers are healthy if eaten in moderation, which flush toxins out of the body. There is no nutrition facts table provided. As a result, the exact sugar and salt levels are not known. This jerky does qualify to have no sodium nitrite, or any other similar unhealthy preservatives. Instead, the main preservative used is salt. Commendably, part of that is minimally processed sea salt, which is high in minerals and trace minerals. Admirably, there is no MSG added. 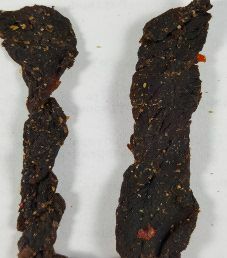 These strips of jerky are small to medium in size, and sliced to a medium thickness. There is a somewhat dry texture, and it is relatively easy to chew. There are no signs of fat, and handling this jerky leaves no oily residue on your fingers. The first flavor detected is a moderately strong Worcestershire/soy sauce flavor. Soon the spiciness begins to take effect. The chili peppers give an instant burst of heat, while the habanero peppers give an after burn. On a heat scale, it would rate about a 3 out of 5 at most. With habanero peppers being among the hottest peppers in the world, you would expect it to be hotter. There is a mild sweetness, and the saltiness is a bit above mild tasting. At light levels are the garlic, onion, and black pepper. Overall, while not having a classic tasting teriyaki flavor with an Asian flair, it is tasty, and works very well to counteract the spiciness. A 3 ounce/85 gram bag sells online or at their store for $9.99. That works out to $3.33 an ounce, which rates as an expensive price. 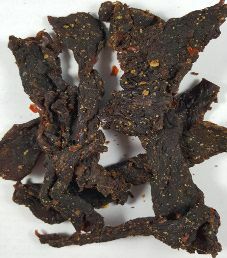 While not cheap, this jerky is recommended to people who would enjoy a teriyaki based flavor with a medium level of spiciness. This non-resealable plastic bag has a label affixed to the front, and nothing on the back. 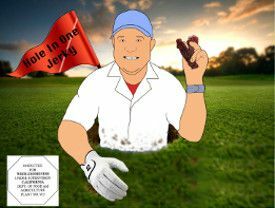 The company logo is a picture of Bud himself, standing in a golf hole with some jerky in his hand. There is no slogan displayed on the bag. The only fact printed on this bag is “Natural Smoke Flavor Added”. There are some bag categories missing such as a nutrition facts table, best before date, jerky weight not stated in grams, bar code, and blurb printed about the flavor or jerky. There is a batch number printed that could translate to a best before date.